The 2017 Ozark Christian Church mission trip is in the books and no one will ever be the same again. OCC sent 11 people in 3 vehicles, 1200 miles (round trip) for 5 days of work with Mission Arlington in Arlington, Texas. 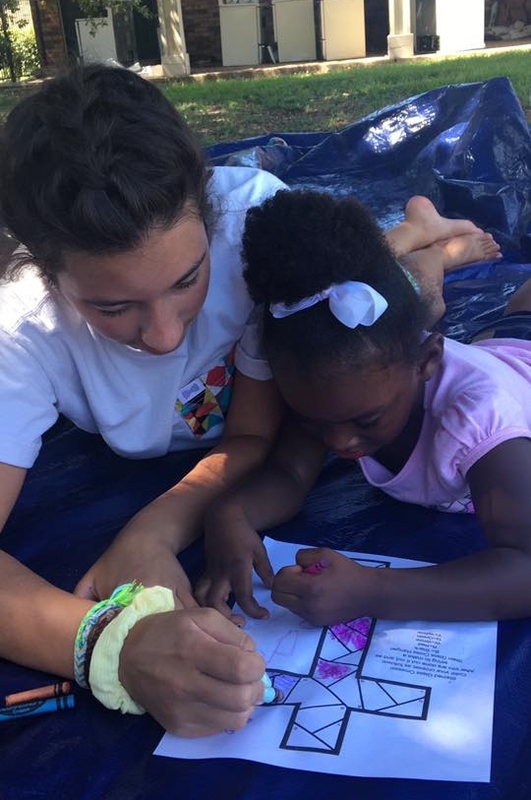 The group had one focus community in Fort Worth to work with, and saw about 30 kids (preschoolers to teens) attend a Bible Study and/or Rainbow Express (Mission Arlington’s VBS for the communities they serve) during the 5 days. Comfort zones were stretched repeatedly during the trip for both the community kids and the OCC group members, yet there couldn’t have been a better way to grow. Many seeds were planted during the days spent in the community, with some of those seeds being harvested (7 kids and 3 adults committed their lives to Jesus during the week) and some of those seeds left to grow and develop with continued prayers from the OCC family. Many lessons were learned by the OCC team, both serious (your testimony can have a huge impact on someone’s life, if you only share it) and funny (when all else fails, try chicken McNuggets). While the work with the kids took center stage every afternoon, and in evening discussions, the team also did morning service projects, including passing out Rainbow Express fliers in communities, picking up donated furniture and clothing, delivering furniture to individuals and a community in need, and sorting clothes in Mission Arlington’s donation room. The OCC group was fed spiritually with morning and afternoon worship services each day, which included uplifting music and meaningful messages about the work being performed. They were also left in awe over Tillie Burgin, Mission Arlington’s founder, and the faithful way the organization goes about serving those in need. The group experienced many blessings during the week, including getting assigned a 2 bedroom/2 bath apartment for 11 people (as opposed to 1 bathroom), located very close to Mission Arlington. There were small blessings (finding lost car keys) and big blessings (2 days of making real connections with the kids after 2 days of near total chaos). These blessings were no doubt a result of the faithful prayers of OCC family back in Ozark. Nothing that happened during the week would have been possible without the love and support of the OCC membership. From the funds raised, to the supplies donated, to the prayers said, everyone became a part of this mission trip whether you were in Arlington sweating in the heat or back in Ozark in a comfy and cool home. “Love God, Love People” is something everyone at OCC does very well, regardless of their location. It was a privilege the mission trip team will not forget, to take that message to the Fort Worth community they served and to the people of Mission Arlington. Story & photo submitted by Marna Strahl.